What wonderful and fun snowy day memories m.o.i., I enjoyed reading this so much and ohh it makes me wish for some snow. Down here in central Virginia it's been a fairly warm winter so far and no snow this year yet. It did get bone chilling cold (for us) and it was 10 degrees here night before last. In my neighborhood we used to put rocks inside the snowballs. Today the wimpy kids would sue each other over a snow facial. I retraced my steps...Bestest Blog to some kid to your English friend to here. Off to Cancun...see you later, eh? Pauline: That's the name! I loved to make the brand new track! Can I borrow kleenex too? Our noses would always be running we were out so long! I'mmhonoured to e-mail you my song! It is getting catchy...even I'M singing it!! Lynclay: Thanks! I do have great childhood memories. I guess you never get much snow, eh? Paul: Rocks? Nah, the girls didn't! Maybe the boys! Oh, I'm glad you could follow the bread crumbs to my blog!I'm envious of your trip! You so deserve it! See ya later, eh? Spoken just like a Canadian!! I too spent my childhood outside - and mine spent theirs inside. I can remember living in Germany as a kid and playing out in the snow, wearing two pairs of jeans and socks, 2-3 shirts under our parkas and STILL getting wet to my underwear! And the pain after coming inside when your ears and fingers thaw out. In snow, I'm a wimp. Went skiing with my family once; spent most of the time in a face plant - 2 feet of snow.......i felt like I was drowning......maybe that's where all the water stuff in my poetry comes from - LOL! At the end of the day, a kind elderly gentleman stopped me and said, "Dear, you really had a rough day up there on the slopes. Every time I looked, you were face down. Are you all right?" Talk about embarrassing.....I spent the next day in the lodge, drinking hot chocolate.........wimp - yeah, me! In Detroit the Snowplows left monds that were 5 or more feet high that we kids walked atop of everywhere we went. one day, i dug a hole in the top of one in front my house, covered thehole with cardboard, camoflaged the cardboard with a fresh layer of snow and went to get my buddy across the street so I could lead him into my trap. distracted by an impromptu game of Risk, I left his house for home and discovered that I had 'trapped" my little sister, and she was stuck in the hole! I don't remember your game. Sounds safer than mine. Much more like the winters I remember and have pictures of too. I don't think kids have changed much. I rememeber lots of kids in high school just wearing nothing more than a lumber jacket all winter - no gloves, hats, scarves, etc. Although, they did wear steel toed work boots. What a lovely picture - thanks for sharing and also for taking me down my own memory lane. You know I love this kind of winter weather too and we have the same in Norway right now. -10C her now and light snow falling down to brighten the cool and dark night. 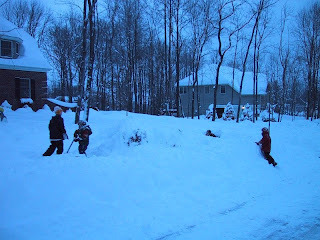 I used to love the hours we spent outside running around the neighborhood in the snow. Then we would all pile into someone's house, throw all our clothes in the dryer and sit around in our long johns drinking cocoa until the clothes were dry. Then out again. Repeat as long as possible. GR: We were both lucky to miss the video/computer craze! Pauline: No Problem! Wonder why my e-mail doesn't show? Haven't checked my profile since I changed to New Blogger! Bob: But that was half the fun! Putting your mitts over the heat registers! RDG: Well, I can't take the cold too much now, either. Not like we could when we were young! I don't downhill ski...have done a lot of Cross-country though! Steve: Yeah, I only heard about boys like you who did that! I wasn't allowed to play with them!!! Richard: I must have been a dipstick 'cause I wore boots and mitts etc. I still can't be out in the cold too long now. Renny: Well, you guys are born with an affinity for the cold outdoors, but I bet you dress for it too! Meno: Definitely fond memories! And it was likely REAL hot chocolate! We have yet to get more than an inch of snow here in Washington, DC. As beautiful as it is, it really snarls traffic and life in general because people and city governments are totally unprepared for real winter! I loved that game! More for the making the track than the running, but the running was fun too. Yesterday, we had a couple of inches (which were gone by afternoon with the drizzly rain) and it was sooo much hassle getting the kids to wear any of the protective clothing! And yet, only a couple of weeks ago, they'd gone out not properly dressed, and been frozen solid by the time they returned... they just don't learn these days! And, at school, probably more than three quarters of the kids won't wear coats (too much hassle to carry them round? uncool? )so every single breaktime they're all crammed in the corridors. Prefects would've chucked us out in my time there!! Barbara: But you usually get more, don't you? We are more than making up for what we didn't get in Jn., and Dec., especially in the Snowbelt area just 30 k north of us where my husband skis. He'll be skiing till mid-April! Shara: Yes! Me too! It was a privilege! Annelisa: Teenagers think it's wimpy and uncool to dress properly, yet they complain of the cold and try to sneak in the school doors. We have a duty teacher who chases them out! are you sure it's not just a game of fox? My school keeps having indoor recess and I don't remember EVER having indoor recess. Plus, I'm south enough that it's way warmer here than it was in Canada. Even when I was student teaching in Ottawa, we always went outdoors. Indoor recess is for wusses. Such fond memories of snow days. 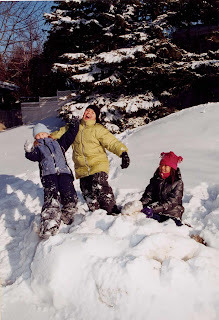 We lived for getting outside and sledding, and the huge snowball fights and the snow angels. I still did it when I had little ones. We built snowmen and sledded until the street lights came on. I was the Mom so I never called them in, since I was playing too. Bobealia:I thought it was fox and something else like goose. Yeah, we were way tougher! Gewels: What a cool mom! Snow falling was always a reason to quit what you are doing, get the sleds and dress! By the time we finished dressing enough snow was on the ground to start sledding! I don't know that game, but remember playing King of the Mountain, all the kids trying for the top spot on the hill the plow made. I love snow. I just wish it wasn't quite as cold as it is. Snow and 10 degrees Fahrenheit is good. Old Lady:It was amazing how quickly snow built up! I think we got more back then. Brooksba: I'm with you on the cold temps and loving snow! Even as a teacher, we had to supervise The King of the Castle thing at recesses! That made me laugh! I'll come and play with you. Last week my boyfriend had to do some plant talks at a local primary school. The kids there also have this 'uncool' thing about wearing coats etc so followed him about shivering quietly. He found it very funny that when they thought nobody was looking they would rub their arms and jiggle up and down!